Principle: It works on the vapor compression refrigeration cycle. Heat from the atmosphere (i.e. water or air) at low temperature is extracted at the evaporator and this heat with input of compressor work is delivered to the condenser. The heat rejected (useful heat) at the condenser can be used for various heating purposes. The working medium is R-12 (Dichlorodifluoromethane CF2Cl2) and the heat source and heat sink is cold running water. The refrigerant is superheated in the evaporator tank and then compressed and pumped through insulated copper pipes to the nickel plated copper condensing coil in the condensing tank. Liquid refrigerant coming from the condenser is passed through silica gel drier to remove any traces of moisture present and then it is expanded through manually operated expansion valve. Now low pressure and low temperature refrigerant is sent to evaporator tank and the cycle repeats. The actual cycle differs from ideal cycle. The schematic diagram of ideal cycle is shown. 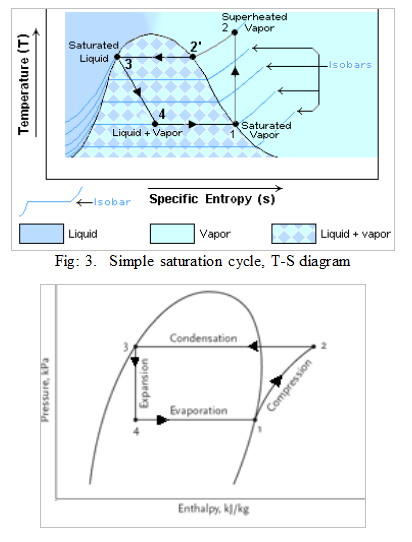 A. Vapor Compression Cycle: There are two constant pressure processes, one reversible adiabatic process and one is enthalpic throttling process. 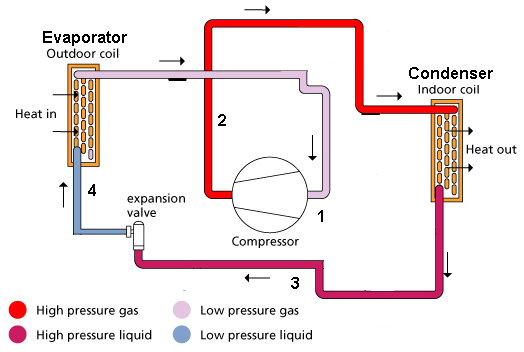 Process 4—1: Constant pressure heat addition process in evaporator. The refrigerant takes latent heat from water around evaporator coils and changes into saturated vapour. Process 1—2: Reversible adiabatic (isentropic) compression with superheated vapour at compressor outlet. 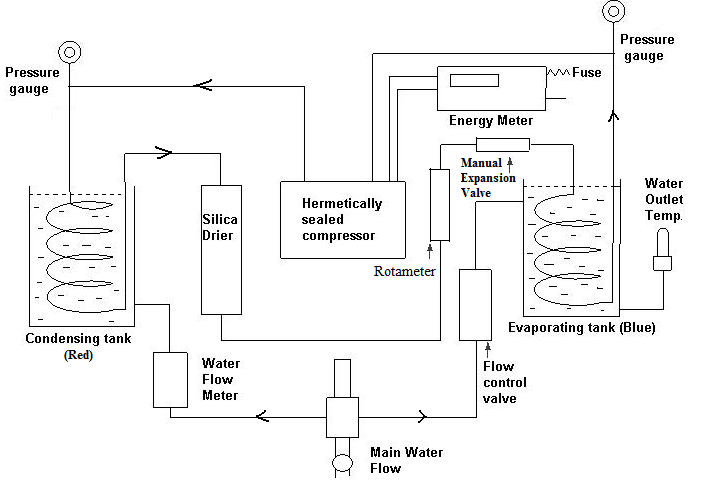 Process 2—3: Constant pressure heat rejection process. The refrigerant rejects heat to water around the condenser tubes and gets condensed. Process 3—4: Throttling (not isentropic but isenthalpic) process. The refrigerant’s temperature and pressure falls.